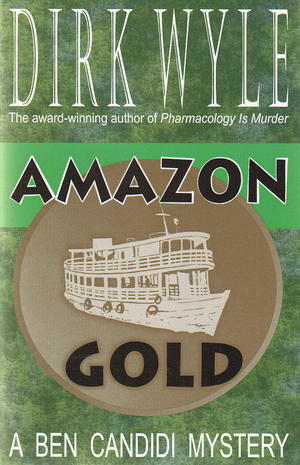 The fourth novel in the Ben Candidi Series, Amazon Gold is a mystery-thriller that appeals to the intellect. The story is powered by medical science, business and anthropology, and is driven by the professional challenges of a two-career couple. There is no room for Ben Candidi (Ph.D.) in the dugout canoe that will take Rebecca Levis (M.D.) deep into the Amazon rain forest to provide medical care to the once-fierce Yanomama Indians. The freelance scientist kisses his physician soul mate goodbye and returns to Miami to complete his report — predicting how emerging technologies may speed the discovery of new drugs. Client Michael Malencik and his unnamed company are impatient and vaguely dissatisfied with Ben's preliminary findings. His project is set back by an unannounced visit by the DEA and by fallout from an anthropology conference which he attends to take notes for Rebecca. Ben's quick thinking foils an assassination attempt on the keynote speaker who then proves suspicious and ungrateful. Other distractions include a surprise visit from Nica Brasaro, flight attendant on the Manaus-to-Miami run. Working hard on the technology project, Ben discovers something much more valuable than predictions. But Rebecca does not return with her expedition and her brief, infrequent satellite e-mails are becoming increasingly strange. When they stop altogether, Ben throws down his report and picks up his backpack. Searching for Rebecca deep in the Brazilian rain forest, Ben wonders whether his most important clues may be back in Miami. In a stunning climax, Ben and Rebecca are reunited to discover astonishing truths — and to fight for their lives.